If it was up to us to decide on the best air compressor, we would buy the Makita Mac5200 Big Bore Air Compressor.The Mac5200 offers a sleek combination of portability + ergonomics. Thanks to the wheels at the bottom and a foldable handle design on the top. It comes with an additional 90 PSI available when CFM is increased to the max level and a 2 strokes big bore cylinder which maximizes air pump output over minimum time duration. Makita is offering a full 1 year parts and repair warranty on each brand new purchase of this unit. Over the last few weeks, I, alongside other co-writers at Power Tool Buzz attempted to take the guesswork out of the entire process of selecting the best air compressor. I like to think it was an excellent job because the air compressors were handpicked, individually reviewed and tested before recommending it to this website’s audience. If there’s one thing that was common in narrowing down on the greatest air compressors , the problem was the “frustration” process. It is daunting when you have 8 – 9 models lined up; all of them promising to be as good as any other top brand in the market. 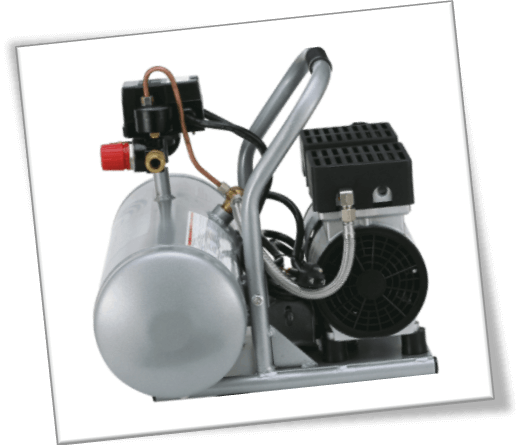 The key is to write down a list of your requirements, and do some background research before buying any air compressor on impulse. Makita Mac5200 Big Bore air compressor has arguably the most rugged performance scale – and that too with not so much of a maintenance factor to worry about. The unit houses a big bore piston mechanism, which allows for faster air build up over a minimum time period. According to Power Tool Buzz calculations, the pistons go up to a speed of 1700 RPM in the cylinders. As far as the big bore system inside the cylinder is concerned, it houses self lubricating oil deposit. Therefore, the friction is much lower and the heat build up is considerably less, as compared to other air compressors within the league. What really makes the Mac5200 series stand out among the rest is because of the unit’s capacity to deliver greater displacement at lower RPM. Yes, once again it’s the big bore theory working in the background. You get a consistent 3 HP power at 6.5 CFM. It is a low more for anyone who’s expecting to use the compressor at home, but it’s the same perk which allows for using simultaneous air tools compatibility. If you are working as a contractor, the robust build quality of the Makita Mac5200 will project a tough-as-nails results. Over the course of the next few years, this air compressor will exhibit minimum wear and tear – i.e. only if you are keeping up with the necessary maintenance and repairs. I don’t think that the first year usage right after a brand new order is placed is going to cause any issues. Cast iron pump design flawlessly integrates big bore pistons. Exhibits fastest recovery time with minimum heat build up. Despite of a hot dog build design, portability and transport are a no brainer. Thanks to the wheels at the base of the unit and a fold-in handle at the top, you are looking at dragging the air compressor over any type of terrain. Houses additional storage compartment slots for storing add-on accessories and necessary air tools. Air hose extends up to 50 Feet! Built in thermal overload system for lower heat levels and overall motor safety. In addition, the tool has an oil drain valve at the front side to help maintain oil levels all the time. Compared to Makita, the closest that any other compressor comes in is the California Air Tools 2075A series oil free model. The company has released numerous versions of different air compressors with the same model number/ name. However, the difference is the storage size of the tank alongside some minor addition, or subtraction of extra perks. California Air Tools 2075A is strongly recommended as the second most reliable air compressor in this air compressor review because of the 40 PSI @ 2.4 CFM output level, low noise rating, a decent storage capacity of 2.0+ gallons and enough horse power to handle 2 low CFM air tools simultaneously. Obviously, California Air Tools has other models which are better than the 2075A and 2010A series. For instance the 5510SE it’s performance supersedes the results of its former predecessors. But the main reason I like the earlier mentioned model is because of how well it matches the needs of average DIY enthusiasts. We have to keep average customer in mind alongside professionals because there are always some people who don’t want to invest too much in a power tool. Coming back to the Makita Mac5200, Mac700 and Mac2400, the only issue with these compressors is the standardized power rating. They operate at 120V, which is a great convenience for household users within the U.S., but it can become a hassle for international buyers. If you are an international customer from South East Asia, or U.K, your power levels should be somewhere around 220V. In that case, make sure that you are using a voltage converter before daring to plug in this valuable air compressor. Otherwise, the unit will burn. In most scenarios, burn cases void the product warranty. So, beware of your country power ratings beforehand. Why Trust Power Tool Buzz and Not Any Other Review Website? We have worked closely with the manufacturers and customers to align the requirements – results ratio of both sides of the equation. The website was made to recommend products to not only professional power tool users, but also the ones from intermediate bracket. Sometimes, I, or one of the co-workers contact a consultant who have prior experience with a specific product. This is a hectic process, but we want to review and finally recommend something which is based on facts – not on made up features and glazing perks that don’t exist in the first place. Besides, air compressors is not the only category of products at this website; we have exclusively published in-depth reviews of other power tools. Don’t forget to checkout our best circular saws, cordless drills reviews, best table saws or best chainsaw review and many other types of power tools at our website. All of our product reviews take the hassle out of standing in aisles of home depot, or Lowes retailer shops, while you have no idea where to get started on picking up the ideal product for a project that’s been begging to be completed for a long time. Which Criterion We Used to Select Air Compressors for Your Money Finalists? That’s a good question – and just in case you are wondering if it is possible to work with a small air compressor with six gallons of storage space on a DIY project, our answer will be yes! Why is that so? It’s simple because we did a lot of research on consulting with companies, listening to users’ recommendations/ complaints and checking out dedicated power tool forums before finalizing the actual best air compressor review. Throughout that process, we also perceived things as not only a well-informed buyer, but also a first timer who has no clue about an air compressor. In addition to doing the aforementioned practice, we checked out dedicated Reddit posts and Subreddits for air compressors and DIY projects. People were already taking about which product worked for them and what should be avoided like a plague. This gave us an idea and a sense of direction about where to start and how to come up with only those air compressor reviews in 2019 which people would actually want to buy. Such details are valuable because it is impossible to narrow down on a store that will let you actually test the power tool. They will not allow you to fire up different models – let alone the noise level is so high and varying that the store is not able to accommodate these requests. Therefore, these stores will only recommend the “hottest selling air compressor” for the reason that maybe the store manager said so, or some models are actually worth it. Also, new incoming products and power tools are recommended by store agents because they want to shove them down unsuspecting customers’ throat. The agents are usually concerned about making sales and bonuses on their daily performance. Sometimes, they have no idea about how good an air compressor is, or what really works in a certain type of DIY project involving air tools and air compressors. 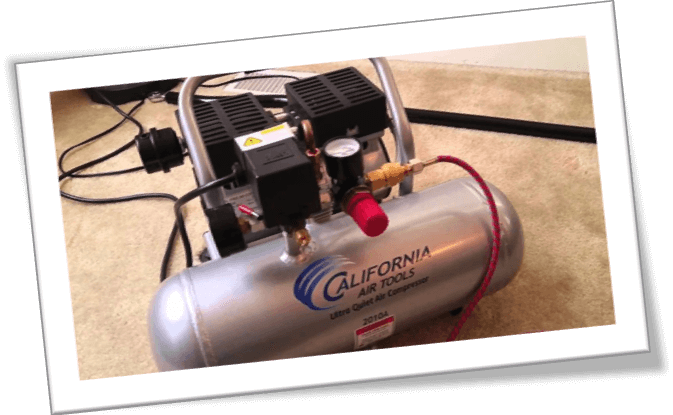 Why Use An Air Compressor? 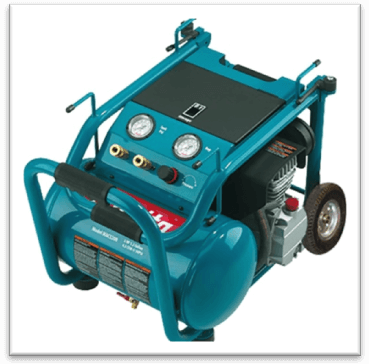 Take a look below at some of the best air compressors. This one is highly portable air compressor in a pancake style build. Therefore, you are looking at 6 gallons storage capacity covering a very small area. It means that portability factor goes up without taking a toll on actual coverage area inside a workshop. Porter Cable has maintained a variable track record with Power Tool Buzz. Some of their products were so-so, but were usually recommended due to the affordability factor. However, the reason we selected the C2002 WK Oil Free series is because it is actually worth it. For additional convenience, this unit works off of normal household power points. You don’t have to use a step down – step up voltage converter for that matter. Operates at a maximum of 150 PSI for longer runtime. 2.6 Standard CFM at 90 PSI helps users to retain the air pressure and storage for uninterrupted performance. At 6 gallons storage space, you are looking to use 2 brad nailers simultaneously. Additional accessories come with water drain valve, extra rubber feet, and hoses. 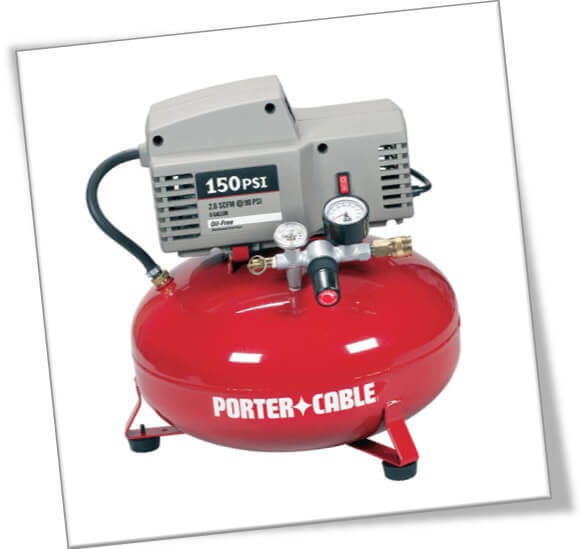 Overall at 30 Lbs., this Porter Cable air compressor is classified as a lightweight power tool. The noise levels on this air compressor are unnerving for naked ears. You will literally have a “blast” if you are standing too close. The additional accessories have a substandard build quality. Porter Cable could have improved the quality of extra add-on goodies to prevent people from spending additional cash on replacements. Instructions manual is not very detailed. Bostitch’s BTFP02101 air compressor is somewhat similar to Porter Cable C2002 series compressor. However, Bostitch is 1 Lbs. lighter, which brings the weight factor down to 29 Lbs. In addition, this is a low maintenance oil free compressor which should at least run fine through the first year of purchase. Just like Porter Cable C2002 series, Bostitch BTFP02012 maintains a pancake style build. You get the same high standard 150 PSI scale air storage capacity. It means there is more storage room over a small area inside the tank. Quick refill time results in uninterrupted operation timing at work sites. 6 gallons storage capacity by default. Comes with extra accessories such as; 25 Feet nylon hose, plugs, quick coupler, add-on gauges etc. 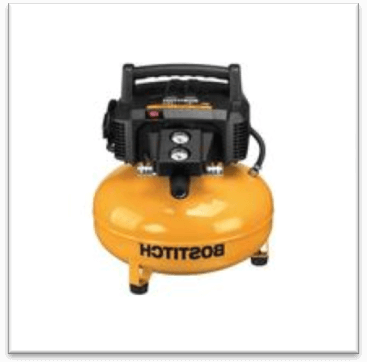 Bostitch is only offering a limited one year warranty on this air compressor. The default stock gauges, and that includes accessory gauges as well, have variable readings. If the scale is not accurate, you will have to purchase extra high quality gauges from the market. Power cord is only 5 feet long. Therefore, while the air hose has 25 feet length, your mobility is going to be limited due to short power cord length. Quiet Air Campbell Hausfeld DC040500 model has different variations. While it is true that the model number changes, the good thing is that the Campbell Hausfeld guys are offering a flexibility in features. If you need an air compressor for basic level tasks with only a little over gallon storage capacity, they have a model in DC04 series lineup. Among different things that I personally liked about the entire range of Campbell Hausfeld air compressors is the safety mechanism. The compressors have an auto switch which turns off if the unit is left unattended or On for too long. The circuit breaker “trips” the switch if you are accidentally overusing the air tool in excess of its maximum output level. This is a good feature because automatic safety switches prevent the air compressor unit from getting any permanent damage. At most, you will only need to replace the switch assembly if it’s gone for good! Quiet Air Campbell Hausfeld is offering up to 10 piece accessory kits on select range of air compressor models. Be sure to check out the company products listing for eligibility. Oil free model. Comes with an oil-less pump for hassle free and maintenance free pumping. Operates at US. 120 Volt standard household power rating. If you are an international customer, please buy a voltage converter before plugging the unit in. Comes with twin mufflers for low noise rating. The DB rating comes down to a bearable level. Comes with circuit breaker and auto trip mechanism. 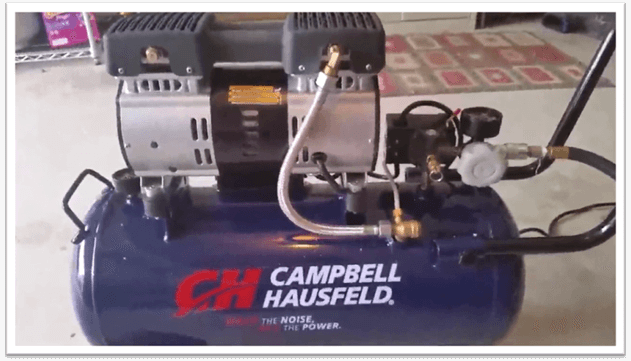 As compared to Bostitch and Porter Cable, Campbell Hausfeld air compressors generally weigh more. The DC040500 model has 38 Lbs. weight. I like to think that the “extra 8 Lbs.” are attributed to a solid build quality. If you are ordering tool only unit, the accessories will not be included with the order. Dewalt DWFP55126 air compressor comes with a roaring 6 gallon storage capacity. For starters, it implies, you can at least use two brad nailers simultaneously, which is a good enough reason to go for this model. The up-sell factor is the exclusive sander test. I wanted to push all air compressors for a task that they were not really meant for. Dewalt DWFP55126 came out with maximum operation time at a standard 90 PSI regulator scale. Sanders are an unusual bunch of power tools. Air compressors are not ideally the best combination for sanders. For this test, the size of test sheets was kept identical. I actually used pinewood sheets, but you can use marble sheets too. I also took the liberty of outlining a pattern on the sheet to follow the same track with the sander, while the air compressor powered everything up in the background. Dewalt DWFP55126 pancake air compressor’s max timing was 42 seconds. I know 42 secs doesn’t even account for a minute, but Dewalt was the only compressor which enabled the sander to operate at its normal speed. Other air compressor’s caused the sander to slow down after a few seconds. Dewalt DWFP55126 model works with sanders for close to a minute. This is one of the key takeaway points. This model offers more CFM than other air compressors in the list. 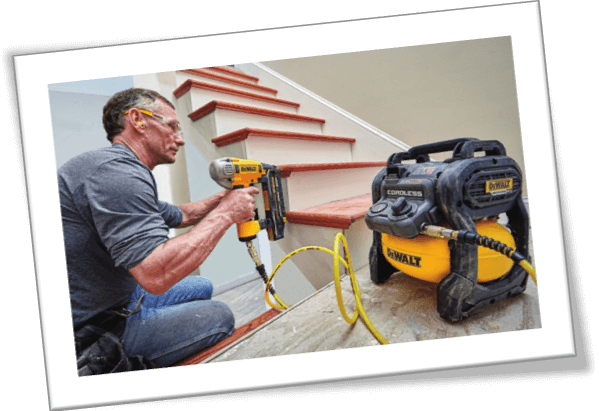 Compared to California Air Tools 2075A model, the Dewalt DWFP55126 is slightly quieter. Not the kind where you can have a conversation with a co-worker while the compressor is filling up, but still a little more bearable. Some units of this air compressors reportedly have a faulty meter. You can contact Dewalt for a free of cost replacement. Ball bearings size in the stock hoses is small. It is unnoticeable, but there is some degree of leakage on stock hoses. The good news is that you can buy high quality hoses from any online retailer’s website. Although this model is good, but it’s not suitable for industrial purposes. Although still not good as a Makita Big Bore air compressor, California Air 2075A and 2010A models are my personal favorite. The 2075A series has 2 Gal. storage capacity and an overall convenient hotdog build style. The horizontal positioning of the tank increases the portability factor for this air compressor. Other models are also made in same style design; you should check them out. At 2 gallons, we are looking at a lower storage capacity, but it is backed up by 40 PSI rating. It means that the PSI correlates to the output level for uninterrupted performance. This model is more of an ideal companion for average home based users and DIY enthusiasts who are just about to get started. It is safe to say that if you are comfortable with the 2075A series performance, you can upgrade to the California Air 5510SE air compressor. The latter model not only houses a hotdog build, but also features a wheelbarrow design, sitting atop 5.5 Gal. storage capacity. The wheels will help you to move the unit without any issues in the long run. 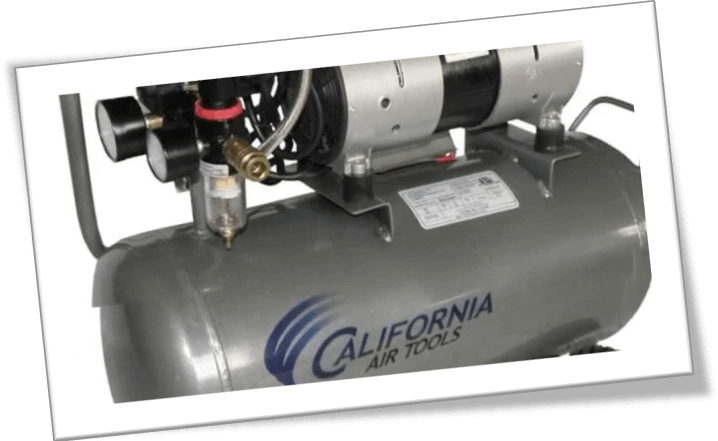 The overall lineup of California Air Tools air compressors is versatile. They have created lower series models for mid-range users, while the 5K series is meant for professionals. Model 2075A houses easily detachable links for hoses. You can operate the tool with one hand. Drain valve offers quick access to air release mechanism. Aluminum tanks are not ideal for storing high pressure air. This model reportedly gained a bad rep for broken units, but you can immediately call California Air for a replacement. Customer service hasn’t been good during the last few years. 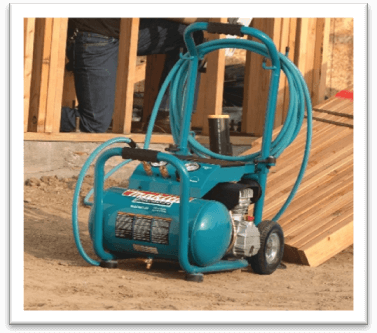 Makita packs a punch with the Mac5200 big bore air compressor. It has a solid build quality and delivers one hell of a performance whether on-site or at a home based workshop setup. This model has a wheelbarrow design with a staggering 8 inch diameter for long term performance. Talk about portability and durability in same sentence! Mac5200 and Mac700 series air compressors are industrial grade. It does not mean that they can be put to use within an industry level setup, but you can at least expect a high level of performance alongside many extra features. Specifically talking, it is the Big Bore pump which has made it possible for Makita to achieve a higher rate of success with the Mac lineup. You can read more about Big Bore at the top of this best air compressor review under the appropriate section. Cast iron pump with big bore schematics. It offers high level of piston performance at the cost of low energy/ power consumption and minimum fill-up time. Mac5200 features a low amp draw system, which itself is a safety mechanism. It means that the chances of safety switch tripping and activating circuit breaker incidents are pretty low. Offers sleek combination of portability + ergonomics. Thanks to the wheels at the bottom and a foldable handle design on the top; you are looking at a unit which doesn’t occupy a lot of space. Comes with 1 year parts and replacement warranty by Makita. Offer applies to brand new models. If you have purchased a “Used” model, make sure that there are still couple of months left in the warranty period. High Noise Level: Despite of ingenious design and solid performance, the Mac5200 series air compressor has a 90 Db noise level rating. This is not exactly a “setback” because the aforementioned performance comes with a trade-in cost. Wheels have a good rubber build, but the screws that maintain the structure in place can easily bend over rigorous use. Like any other industrial scale power tool, this air compressor requires a bit of maintenance on the side. Just as it was mentioned earlier, we made an effort to keep all kinds of users in mind before coming up with the best compressor in 2019 write-up. The mixed variation offers more wiggle room where we can recommend products to users who come from all walks of life. Overall, I think that 6 gallons should be the standardized storage capacity on modern air compressors. Mind it, 2 gallons or anything less can become frustrating. I know that California Air Tools 2075A model has 2 gallons capacity, but if perceived from future proofing point of view, I wouldn’t recommend it to late comers. Small air compressors are good, but they are only suitable for “small” scale jobs. In this context, this air compressor review is not to be taken as a literal interpretation of the best air compressors available today. Even the average homeowner can find reasons to ignore a regular model, and go for a commercial scale alternative. It all comes down to the actual scope of the project and the requirements of the contractor. However, all of the above air compressors are ideal in somewhat limited capacity for a great ranger of tasks. Crown molding, last minute professional nail gunning, spray painting and etc. These tasks are done quickly, and sometimes we were fooled into thinking that we were having fun. It’s not too late to get started with your very own version of “fun” with a high quality air compressor. Thanks for reading our air compressor review and make sure to share your experiences in the comments below.